Lakeside stone cottage in peaceful Ribatejan countryside. Tranquil lakeside cottage that offers you the of best Portuguese countryside combined with lakeside living. Ideal for walkers, cyclists, water sport lovers or simply for those who want to get away. The house is 300m from Castelo do Bode, one of Portugal's biggest lakes, and is ideal for families, couples or groups of friends. The house is self-contained with a garden and patio where you can sit, eat, drink or simply enjoy the views. Swimming: Castelo do Bode (castle of the billy goat) lake is 300m away. The water is refreshingly cool in the summer and it is wonderful to swim in. There are plenty of pluvial beaches to choose from and there is a map in the house. They are all very close. Fishing is also possible and there are boat hire facilities in Ferreira do Zêzêre, approximately 20 min by car. Cycling: The Ribatejo countryside is unexplored and there are plenty of tracks you can follow. There are two bicycles in the garage that are freely available for guests' use. It's an ideal way of exploring the countryside. And if you get lost don¡t worry all roads lead to a café. Sightseeing: Tomar, the historical town of the Order of the Templars is a short drive away. The Convent of Christ on the hilltop is a must. The Sanctuary of Fátima, holy place of pilgrimage is around 30km away. Castelo de Almoural, set on a tiny island of the Tagus was built as a fortress in 1171. Lovely spot for a picnic. Torres Novas has many fine churches within its castle walls. There are many small villages around the lake that are worth visiting such as Dornes, a UNESCO protected village and Constância, right on the banks of the River Tagus. We saw this property advertised and fell in love with it when we stayed for a weekend. We have always loved stone houses and thought there would be plenty around but actually Casa de Pedra is one of the few around. The garden is big enough to laze about in but also small enough to maintain as we don´t live here. All the trees we have planted belong to our two sons and they absolutely love staying at Casa de Pedra as do we! Whatever time of the year you go to Casa de Pedra there is always something to do. In the summer the lake is fabulous and much better than the rough, cold sea you find on the Atlantic coast and in winter there are plenty of country walks to go on. It is also incredibly still and peaceful so a real treat to recharge your batteries. But the best part for us is that it is still authentically Portuguese where time seems to have stood still. The kindness and friendliness of the people who live around this area is simply wonderful. A littel gem! Beautiful old house with modern improvements. A delightful stay. We loved the house. Beautiful old stone work. So sturdy it even withstood the hurricane. It was pleasant to sit on the patio and enjoy the sunset. Inside the house has been fully modernized without losing appeal. We had no problems and enjoyed our visit at the end of the road. Casa de Pedra is an excellent place to stay with everything you need. It's in a lovely setting with tracks, trails and country roads to follow and explore the many tiny villages. A large, comfortable living area and a well-equipped kitchen including washing machine and tumble dryer. The dining room is spacious and has a large sliding glass door to the exterior. The dining table is large with nice chairs and, thoughtfully, chairs for children. 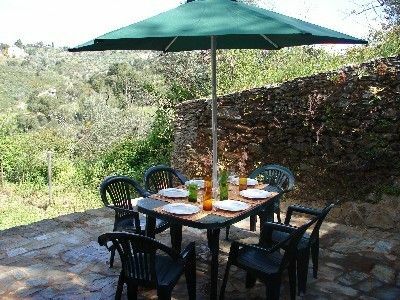 There is an excellent terrace with a large table and chairs with a barbecue. There are mountain bikes in the garage. The nearest town is Serra which we initially dismissed, but quickly came to like and enjoy. One of the ladies in the Post Office speaks excellent English. The supermarket is very good for such a small town and the butcher's shop next to the Cafe de Serra is very useful. The Cafe de Serra does no-nonsense food such as chicken and chips with soup and dessert and a pichet of red thrown-in for ridiculously cheap prices. beware the portion sizes and order one between two!! Have a coffee (or three) outside the little cafe and look out for the old Goldoni tractor with added modern bodywork - amazing The area round the casa door is a natural suntrap with a row of chairs where we had G&Ts and nibbles on most evenings. The lady who looks after the house is called Olinda, is lovely and lives just up the road. Everyone in the area is friendly and "Bom Dia" (good morning) and "Boa Tarde" (good afternoon) are obligatory! If the water level in the lake is high, the "beaches" disappear! A visit to Castel de Bode to see the huge dam is a good idea and you can visit Constancia which is very interesting and Sardoal which we really liked. Dornes is lovely too. Tomar is the obvious attraction and well worth a visit. On the way in you can get an excellent lunch for a very reasonable price at the cafe in the Modelo Continente supermarket. We had four weeks in Portugal in this casa and another near the Spanish border and I've lost track of the number pf pastel de natas that we ate! The "Gourmet" ones in the Pingo Doce supermarket are superb! People have commented in other reviews about the derelict houses nearby, but they didn't bother me in the least and I quite enjoyed exploring them and speculating on just what happened to this little village of Esteveira. The bread van comes each morning at about 08:00 and the large-bun sized loaves are wonderful in taste and texture. Some Spanish friends visited and loved them! Thank you P & L for such a great review. We are really pleased you loved your stay at Casa de Pedra! You really made an impression on the locals who still talk about you fondly! Thank you for including your top tips in the review as this will certainly help other guests. Até logo! I book this house, because it's said River front, and the price is fantastic , it's actually river in the area you have to walk pretty good distance to the river. Thank you for your review Angie. We are glad you had an enjoyable stay and discovered the beauty of the place. The drought in Portugal continues and unfortunately the part of the lake which is very close to the cottage dried up over the summer. Let's hope we get our much-needed rain so that the lake fills up again and nature makes a full come back. The house is a little difficult to find which is why we send all our guests detailed directions (including photographs) on how to get there. A wonderful, relaxing experience in a well-equipped, private and comfortable home. Great assistance, before visit, from Simona and Wilf. Would highly recommend and would love to return to a magical part of real Portugal. Thank you, Simona! We where at the cottage for only 4 days, but they where absolutely splendid. The cottage itself is very cosy and nice, we felt right at home. The garden and the patio are great to lounge around, and the lake is really close for a quick dip. We liked it so much that we where really sad that we had to move on. Wim, we are so happy to know you liked it so much you didn´t want to move on! We feel the same way when we stay there. Come back soon! Das Haus entspricht voll und ganz der Beschreibung. Alles ist in gutem Zustand, funktioniert und ist sauber. Die Lage ist wunderschön und sehr ruhig. Viele hilfreiche Tipps des Vermieters in der Beschreibung. Dona Olinda hat uns begrüsst und alles gezeigt. Die Umgebung ist schön, es gibt viel Interessantes zu sehen. Tomar ist eine ganz nette kleine Stadt zum Bummeln, alle Einkäufe lassen sich dort erledigen. Wir haben uns sehr wohlgefühlt und können das Haus nur empfehlen! Einzig die Liegestühle für draussen könnten etwas bequemer sein, sie sind für ältere Menschen zu niedrig. Wir freuen uns sehr, dass Sie Ihren Aufenthalt im Casa de Pedra genossen und dass Sie einen komfortablen und gut ausgestatteten gefunden. Der See ist sehr schön zu dieser Zeit des Jahres, so freuen wir uns, Sie in der Lage, es zu genießen waren. Guter Punkt, um den Liegestühlen - wir werden in immer andere, die leichter zu bekommen aus sind aus! Wir würden uns freuen, Sie bald wieder in Casa de Pedra begrüßen zu dürfen! The Ribatejo region has traditionally been an agricultural area with many vineyards. The river Tagus and Zêzere flow through the area and the latter was flooded in the '50s to create Castelo do Bode, a huge reservoir that provides water to most of the Lisbon area. Above the dam the Castelo do Bode lake lies nestled in a valley full of pine and eucalyptus forests dotted with isolated villages. The valley is a secluded area popular for boating, fishing and water sports. Portugal has a wonderfully mild climate and despite wet winters it never gets very cold. The summers are warm but with an Atlantic breeze in the evenings, one can really enjoy outdoor dining. The house is right by the Lake Castelo do Bode (Castle of the Billygoat). The area is very green and the countryside is extremely peaceful. There are plenty of fluvial beaches - the water is very clean, ideal for swimming and certainly good for cooling off in the summer. Tomar, famous town of the Knight Templars is only 12 kmaway.